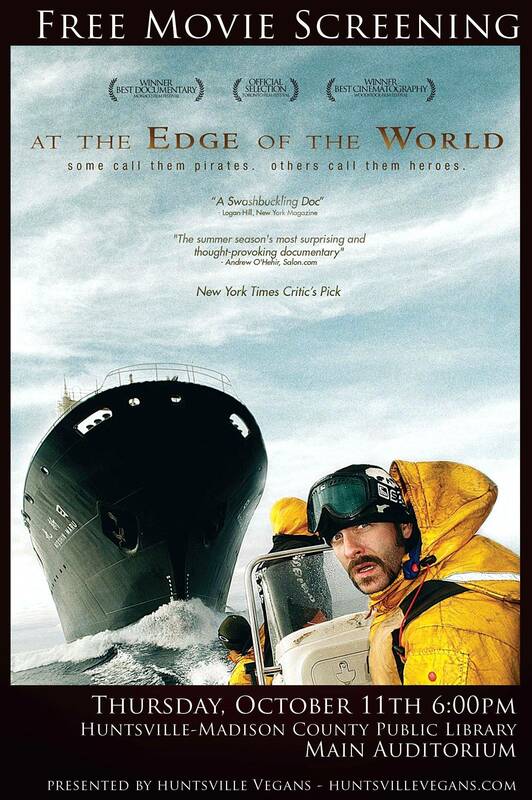 Huntsville Vegans is hosting another free monthly movie night/food sharing on Thursday, October 11th, with a screening of At The Edge Of The World (2009). Our monthly movie nights take place on the second Thursday of each month at the Huntsville Public Library (in the auditorium on the ground floor) in Downtown Huntsville. Doors open at six, and we’ll start the movie itself around 6:30. Local Sea Shepherd expert Alexandra Craig will introduce the film by talking a little about Sea Shepherd and its ongoing efforts. “The 3rd Antarctic Campaign undertaken by the controversial Sea Shepherd Conservation Society was arguably “the perfect combination of imperfections” and the actions taken to stop a Japanese whaling fleet were astonishingly reckless and admirable. The international volunteer crew, though under-trained and poorly equipped, has developed a combination of bizarre and brilliant tactics with which to stop the whalers. But first they must find the Japanese ships, a far more difficult challenge than ever imagined — long-time activist Paul Watson and first-time captain Alex Cornelissen employ an array of strategies in the hopes of finding an elusive adversary in the 370,000 square miles of the Ross Sea. At the Edge of the World – Trailer from Jonathan David Kane on Vimeo. 2013 screening dates coming soon!